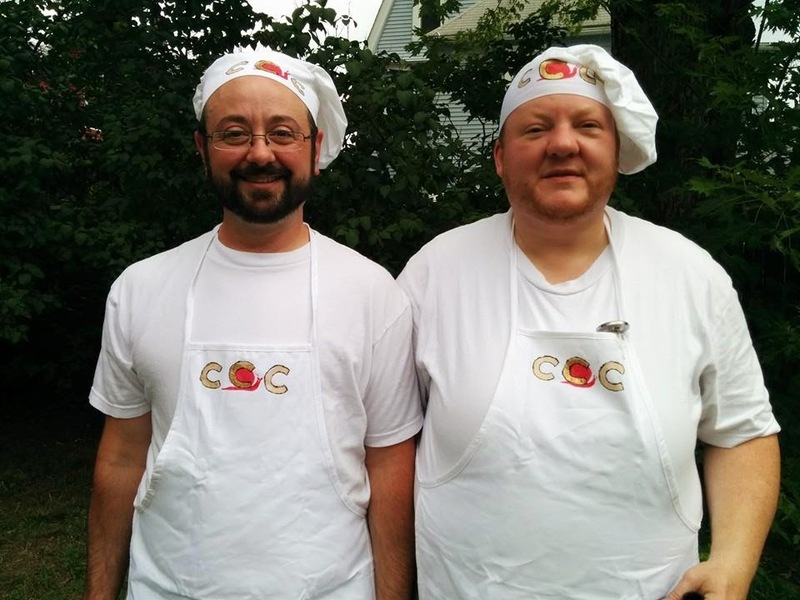 Locavore Justin Cascio blogs about sustainable, seasonal comfort food from western Massachusetts. 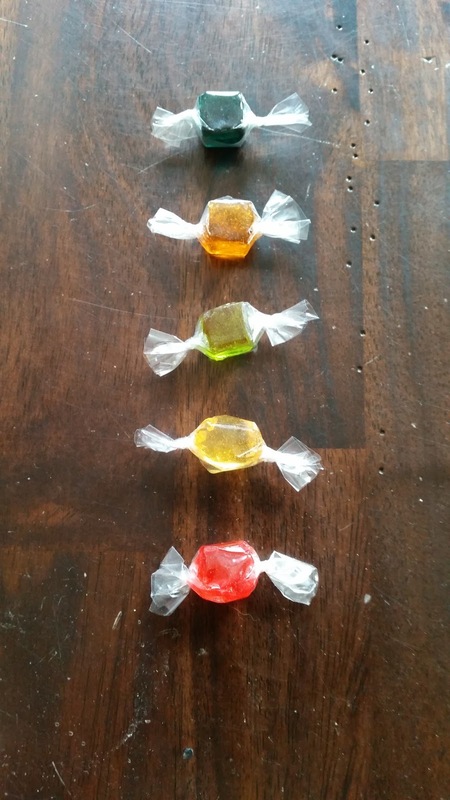 Advice and instructions for making cannabis tincture and infused hard candies. Making tincture is an expensive project, and candy, though simple, is a little more dangerous to work with because of the high temperature involved. Still interested? Keep reading. You will need some special equipment, a significant quantity of high quality cannabis, and a certain fearlessness of disfiguringly hot liquid candy to complete these recipes. When you're done, you'll have a supply of tincture that will last for months if stored properly, and some lovely candy that is discreet, and easy to carry and take whenever smoking or vaping is inconvenient. Because we already make a lot of candy here at the holidays, I had some needed supplies on hand, like a candy thermometer, candy molds, colors and flavors, and cellophane wrappers. If you're making tincture, you'll need a glass jar, preferably of a dark color, with a tight fitting lid, and a tincture press. I already own a small selection of candy molds. My favorite for hard candies, hands down, are a pair of silicone mini cube trays, each with 81 half-inch cubes. I use them both and get something over 110 pieces per recipe. There are many attractive silicone candy molds on the market. You'll need enough silicone candy molds to hold about 161 ml of liquid candy. Yield will vary depending on the volume and type of tincture and additional flavorings you add. I had 5" x 5" cellophane wrappers on hand that, cut into quarters, were just the right size to wrap my half-inch candy cubes. Hard candies are sticky, so they must be wrapped individually for storage or you'll have one giant candy. If you're making your own tincture, you will want a tincture press. To make strong candies, you need a very strong tincture. Any tincture you can't get out of the mash is lost to the compost. You can't make tincture without losing some product in the straining, but you can minimize loss with efficient mechanical pressing. Before you begin, decide what candy mold you want to use, and how strong you want a single piece of candy to be. I recommend something between 2-10 mg of THC for a small piece of hard candy. Ten milligrams is what Colorado has standardized upon as a single dose in an edible. If you're not an experienced cannabis user, or if you're not experienced with edibles, 10 mg could pack a lot of punch. Individual experiences can vary a lot. Be cautious in dosing until you are familiar with your own candy's strength. Remember that edibles take longer to come on than smoking or vaping, which are nearly instantaneous. It could take from ten minutes to two hours to experience the effects of edibles. Determine the volume of a single piece of candy in your mold by pouring water into it, then measuring the water it takes to fill. Divide the total yield of about 161 ml by the volume of a single piece of candy to find out how many pieces you'll get from a recipe. Multiply the anticipated number of pieces of candy by the amount of THC you want in each: that is how much THC must be in the tincture you add to the recipe. When making the tincture, make it strong enough so 1/8 cup or less is sufficient to infuse a whole recipe of candy. Added flavor and color are both optional. A very strong tincture has an herbal flavor that pairs well with many spices and fruits. A 2 mg hard candy will taste principally of the added flavoring, while a 10 mg candy will taste mainly of tincture. I recommend using LorAnn Hard Candy Flavoring Oils or a high quality alcohol based extract. Stronger candies are also darker in color. The second candy from the top in the photo is of 10 mg strength and has no added color. Milder candies will have a lighter tint. The candies pictured were made with 1/4 cup of glycerin tincture each, but of different strengths of tincture, so the top two candies are much stronger than the next three. 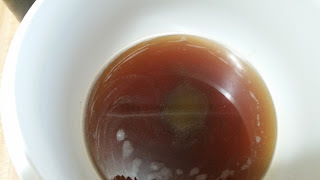 Using a quarter cup of tincture made them difficult to work with, and some of them did not solidify well, which is why I recommend you make your tincture strong enough to use half as much. Your hot liquid candy solution will be easier to blend, and the finished candies will be less sticky. Also, alcohol will mix in more smoothly than glycerin. Tincture is added at the end of candy making, when the mixture has cooled enough that it doesn't degrade the active ingredients. The top pictured candy is a 10 mg strength piece flavored with raspberry, and colored with three drops of royal blue coloring. The second piece is pear flavored, of the same strength as the raspberry, but has no added color. The next three pieces are of 2 mg strength. The middle candy is flavored with 2 tsp of Key lime extract, and colored with a drop each of yellow and green. The very gooey looking yellow one is not solid because in addition to the quarter cup of tincture, I used a quarter cup of ginger syrup to flavor them. There's no added color in these, either: the hue is a combination of tincture and ginger syrup. They taste great, and I'd try making them again, adding the syrup with the sugar before cooking, instead of at the end with the tincture and color. The bottom candy pictured is cherry flavored. I probably colored these with two drops of red color, but didn't make a note of it. There are two tincture solvents you can use that are both good for hard candy: glycerin and alcohol. Glycerin has a sweet taste and is a good choice if you want to be able to ingest the tincture directly. It's tasty by itself, or with a flavor added. A 1:1 blend of glycerin tincture with ginger syrup is very nice tasting. 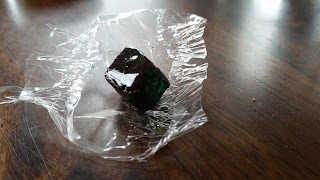 Whether you take the tincture directly or in a hard candy, you can absorb some of the active ingredients sublingually by holding the tincture or candy in your mouth for a few seconds, instead of swallowing it right away. The THC absorbed this way takes effect much more rapidly, and the effect is several times stronger than it would be if you swallowed it quickly. Glycerin tinctures do not denature the active ingredients in cannabis like alcohol does, which some argue makes for a better quality of effect. However, there are advantages to using alcohol to make a tincture. It can hold a higher quantity of THC than glycerin can: up to a 1:1 ratio of pure THC to alcohol, compared with 1:3 THC to glycerin. A typical ratio found in commercial tinctures is 60% THC. Another advantage to using an alcohol tincture for candy making is that most of the alcohol evaporates immediately when added to the hot candy, making it easier to incorporate without affecting the texture. It's up to you how much tincture to make at a time. Make it as strong as you need. If you're using glycerin, mix the glycerin and decarboxylated bud into a crock pot, set it to Warm, and let it gently cook for as many hours as you like. I haven't found any evidence in favor of very long steep sessions, but many sources will advise you to steep a heated solution for up to twelve or even twenty hours, and a cold solution for as long as a year! Five hours works perfectly well for making a glycerin tincture. If you're making an alcohol tincture, mix the alcohol and decarboxylated cannabis, and steep at room temperature for three hours. According to one source, longer than three hours draws out the chlorophyll. But if you decarboxylate, the chlorophyll is destroyed, so that's not a concern. Chlorophyll is not psychoactive and its flavor and color can be unpleasantly assertive. Another option with alcohol is to steep it in the freezer. When you're done brewing your tincture, strain it with whatever means you have. You will have to work at it to get much more than 75% recovery of your original solvent volume. If you plan to make tincture even once, a press is a good investment. Store tincture in a dark colored, non-reactive container, out of the sun. (Sunlight destroys THC.) It will keep for months. I have been calculating the strength of tinctures based on what I put into them. If you don't know what strain of cannabis you're working with, 10% THC is a reasonable estimate for high quality bud. If you do know the strain, you can look up its average and highest test values on Wikileaf, and use one of those figures. A gram equals 1000 milligrams, so a gram of a typical sativa has about 10 mg of THC. My methods will yield a very rough estimate of dosage. There are testing companies and devices that can get you a more accurate result. Take notes on your work: how much cannabis you used and what kind, which solvent you used, how long you steeped it, and then when you make candy, how much tincture you used in the recipe and how many pieces of candy you got out of the recipe. When you eat the candy or take the tincture directly (I don't recommend you take the alcohol tincture directly, because pure grain alcohol burns) also note when you ingested it, what else you've eaten before and afterward, and when you begin to feel the effects, when they peak, and when you no longer feel them. Eventually, you will develop a rule of thumb for how much you want to ingest to get a desired effect. Put sugar, corn syrup, and water in a saucepan and heat on stovetop. When it is warm enough, stir it to completely dissolve the sugar. Cook to 315 degrees. Take sugar off heat and stir gently. The temperature may continue to rise. Stir until the temperature has dropped to 250 degrees. Add tincture, flavoring, and color, and stir until completely incorporated. Pour candy into molds. Smooth tops with a spatula. Let cool completely before removing candy from molds. It should be stiff, not bendable. Candy will still be a little sticky but should keep its shape while you're handling it. Wrap candies individually. Store in an airtight container in a dark, dry, cool place. Enjoy responsibly. Keep your cannabis candy locked up away from children and pets. This year, you can find me blogging at The 365 Dinner Project. Every night after I do the dishes, I post the picture I've taken of dinner, and I talk about what I made. 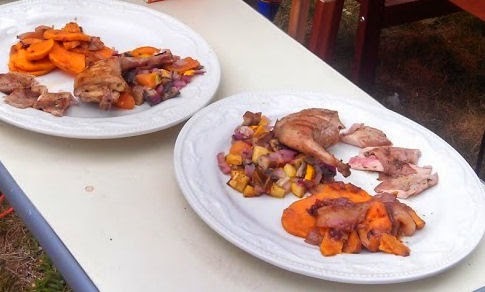 A backyard grilling competition yields a rabbit recipe worth sharing with a crowd. This weekend, Kevin and I competed in a local, queer grill-off, in which each team is given a "mystery protein" to make the centerpiece of a grilled dish. The game's host imported this event from the midwest when he moved to the Valley; this was our first time playing. Kevin and I like to watch "Top Chef" while we eat dinner. It's light entertainment, lightly interactive: we both feel free and qualified to talk back to the TV. The repeated exposure has improved my home cooking. I'm less likely to serve an entirely beige meal, more likely to think about plated food as something other than flat. A representative from each team stepped forward to draw a number, and then we were given our platters, covered in foil. When we pulled off the wrap, a new twist revealed itself: this year, each team got the same protein to work with. Kevin is my grill master. He had the coals ready for competition in the half hour before we received our proteins and were turned loose on the sparse pantry. There were many kinds of fresh herbs, several fruits and vegetables, but there were few other ingredients: a couple kinds of vinegar, oil, some fish sauce we brought. But no dry spices: no cumin, or coffee, or cayenne. We were allowed to bring as much equipment as we wanted, but no notes, and no Googling on our smartphones. It had been years since I ate rabbit. Now that I think of it, I can't recall when I have ever eaten it. I'm sure I must have. I've had squirrel, and that is the closest to rabbit that comes to mind. Butchering a rabbit is less like taking apart poultry, much more like a tiny, tiny lamb, though I started off as if with a chicken, taking off the rear legs, then the front ones. Once I had the legs off, which continued to remind me of chicken parts, in their size, shape, boniness, and flavor, the remaining meat was a very thin loin roast, which Kevin grilled on the bone, and then I took off and sliced to serve with the rear legs. We ate the front ones ourselves: they were like chicken wings. Rabbit loin is much finer than chicken, but the comparison holds: it's white meat, and when done right, juicy, yet fairly lean. The meat is mild, to my palate. It's also exceptionally tender. Because it's got some flavor of its own, and is also tender, it makes for fine grilling. A young rabbit like this one would have also been good fried. Although a rabbit is roughly the size of a chicken, it has no breast to speak of. There's not much meat on one. Two light eaters can share a rabbit for dinner. Kevin made a couple of side dishes, one sweet, one savory. The savory one was a mix of light summer vegetables: zucchini, onion, and tomato, with a touch of fish sauce and lemon juice, oil, salt and pepper. The sweet one was my favorite: foil packet sweet potatoes with apples and blueberries, some sugar, thyme, and mascarpone, and a finish of lime zest. We didn't win the competition. But the judges liked our costumes and said our rabbit was their favorite of the three. And we got to meet a lot of really cool, queer foodies, so in the end, everybody won. Remove the legs from the rabbit. Sprinkle salt on all surfaces of the rabbit pieces. Place the salted rabbit and all remaining ingredients in a ziplock bag and shake and massage to distribute the marinade. Hold at room temp (or in the shade) for about 30 minutes. Build a small charcoal fire. When the coals are ready, grill directly, turning as needed, until the outside is golden brown and the internal temperature is 135 degrees Fahrenheit. Remove from grill and rest five minutes before serving. Late winter, early spring, in New England, is a time of wild confusion. It starts when the trees begin to glow red with sap at their tips. Then I notice the return of bird noise: the whole world is waking up. Some of us wake up confused, aroused, foul tempered, or hungry, or all of these. It's not just me. The way to get through the starving time in western Massachusetts is by laying in reserves: not just of provisions but of personal vitality. I move, and gather sunlight, while I can, every day, even if a short march through burning sleet is the best I can manage. 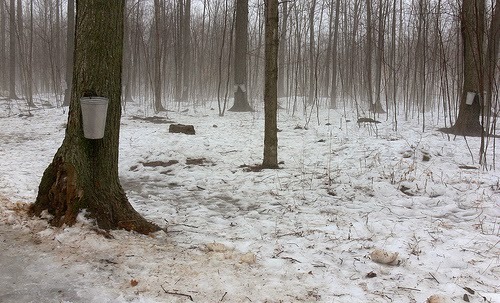 Only now, as my world thaws, does my faith in the natural world---to feed me again, next spring---quicken. It is not so much that I doubt as that belief is suspended for the winter: dormant, not dead. This weekend, we had our friends Julie and Reggie over, so we got to see them for the first time since we married them, last year. I make gooey vegetarian lasagna. We eat every kind of forbidden junk food, get a little tipsy, and talk about our families. It's very therapeutic. Reggie asked me whether I believe in miracles. My answer was full of cultural relativism---that's what you get when you come to me with your pastoral issues. I told her that when I was in the hospital, just after back surgery, it helped me to bring to mind the faces of the people who wished me well. Does it work to ask? Yes, but not in the way you might think. It's been just over three months since I went through spinal fusion surgery: my full and speedy recovery is timed to arrive with the longer and warmer days. Friends coming for dinner tomorrow, have gotten me here, one week at a time, by showing up, even on the Thursday nights that I couldn't cook for them. When Kevin had his hands full, caring for me, they brought food and company. Last week when they came in the door, I realized how important this was, this gathering of four guys to eat sandwiches once a week and check in. Even on the weeks when I felt hopeless. Especially those. Some miracles are hard to bring about, but some of them happen without our having to do anything at all. I'm certainly run down on vitamin D stores, and I'm positively craving fresh spring greens, but the sun is returning. I have my practices in place for capturing the goodness while it lasts, making it last. No human sacrifice necessary. Not that I want to continue coasting on zero effort. I'm moving past the couch bound stages of healing into active trudging, and occasional artistry. Tomorrow, for dinner with the guys, I'm making a mojo criollo from leftover orange juice and fresh oregano, to marinate a ham steak, and roasting potatoes in freshly rendered suet; I've still got lots of kale in the freezer. I might even make a pudding. It's how I like to say, I'm glad you've come back. Plain tomato sauce and, "You've Gotta Have Heart"
Late season fruits are the sweetest... I turned the last tomatoes of the summer into a plain, sweet sauce that I can use through the winter. And, organ meats! I've been asked by people who want to eat more healthfully, for advice on selecting produce. The good news is that we can all do it. If there's one thing human beings have been doing forever, it's picking out what's best to eat. A school of thought in personal nutrition that has always fascinated me are the Instinctos, or Anopsologists, who always eat their foods singly---there is no Instincto "cuisine"---as well as fresh and raw. They choose their nutrition, one food at a time, and eat it until they no longer want it. This is the way I'd advise you to select your fresh foods, at least as a starting point. Be a human animal, first: if it helps, pretend you're a gorilla, or a chimpanzee. Look for what catches your eyes. Pick it up and weigh it in your hand. Prod it gently with a finger. Give the bunch of celery or melon or whatever it is a sniff. Do you want to eat it? Put it in your basket. I was late to the fields this tomato season, so I only got one unlimited harvest. By then, most of the fruit was on the ground. The one kind of tomato that was most plentiful was a small, orange variety that was similar enough to last year's golden tomatoes, which made a wonderful sauce, that I was willing to take some risks to get some home. The other shareholders were avoiding these tomatoes, for being on the ground, but I got down and started gathering. If it felt firm like a grape, I picked it up for further inspection. If it was especially dirty, I'd wipe off the dirt so I could check it for bug holes. I was looking for an unbroken skin, no bruises, and especially no round marks, indicating that a bug had made its way in and might still be inside---it or its offspring. If the tomato met all those requirements, I put it in my bag. At home, I dumped them all into a sink full of water and started washing and sorting. Some tomatoes got squished on the way home, so they went into the compost bucket. I gently rubbed each fruit's firm skin with my palms and fingertips to get the dirt off, and removed the stems, then set the clean tomato in a colander to drip. In batches, I ran the tomatoes through the food processor, then into a big pot on the stove to simmer. I added a generous glug of red wine and one of olive oil, and a little salt, and let it cook for several hours. The resulting sauce was thick like jelly. And when I say it was sweet, I mean that I didn't even use onion, and the sauce was still nearly as sweet as store bought. That's vine ripened sweetness for you. I let the tomato sauce cool, then bagged it in cups and quarts for freezing. Some of it I used right away in place of fresh or canned tomatoes: in the red dal in the photo above, and in a stew of beef heart, turnip, and kohlrabi that we're eating right now. 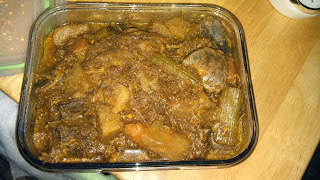 Like the beef tongue I posted about last time, heart makes good stewing meat, and is very cheap. This heart was given to us by the farmer when we picked up our order---some people don't like the organs and just won't take them. Honestly, I'm not crazy about kidneys or livers, and I've never tried brain, but heart and tongue are muscle: a good starting place if you're just trying organ meats for the first time. 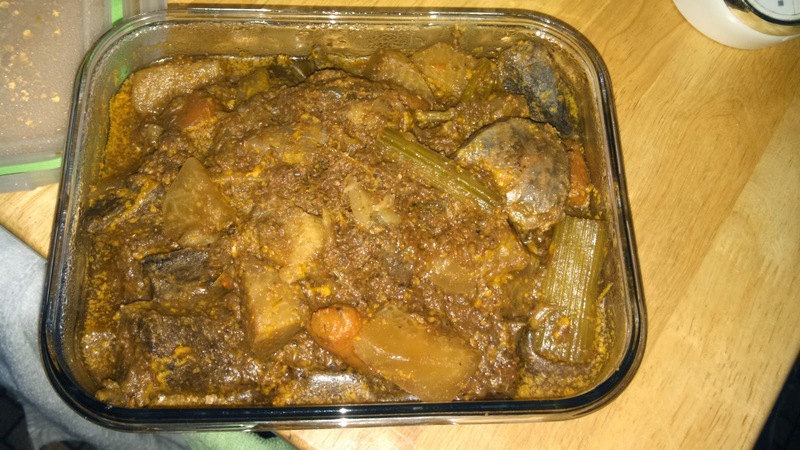 They cook up like beef and are lean, but become tender with stewing. Heart has a touch of that organ-y taste that liver and kidney have, but not much. I'm surprised beef hearts haven't caught on more, especially with the Paleo crowd. The easiest month to eat local in New England might be September. This is what we ate---and shopped for---this week to feed two. I’ve had a couple of requests for our weekly meal plan and grocery shopping list. We keep a spreadsheet where we track our appointments for the week in a condensed form, as a reminder, and columns for food we must plan to eat, as well as what we eventually plan to make and eat each day. Sunday morning, we sit down with our coffee and update the “Considerations” column for each day of the coming week: any appointments that shifted, or other plans we have that will affect available prep time, or put extra restraints on the hour dinner is served. Are we expecting company? We’ll make a note of that. Once we map all that out, we take a look at what’s in the fridge and freezer. Since we’re at the end of the last quarter beef and half pig we bought, we’ve been keeping a list of what’s still in the freezer that we need to incorporate into meals. Anything still left in the fridge that needs to be used goes in another column of the spreadsheet. We just got back from vacation, so the fridge was particularly bare on Sunday. We always plans at least a couple of leftovers days, which I manage by cooking more than four servings at least a couple of times during the week, if not more, so there will be extra beyond lunch the next day. 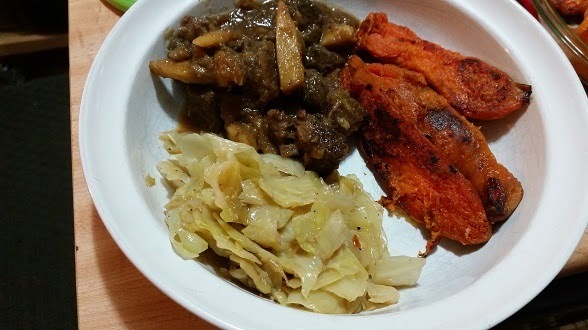 Right now there’s a serving of beef tongue with cabbage and carrots still in the fridge that I showed our friend Dave, mostly out of foodie pride because he’s also a foodie, and forgetting that he’s kind of squeamish about strange meats. Kevin grabbed a slice and popped it in his mouth right there, knowing it makes good cold sandwich meat, and I offered it to Dave, too, but he wasn’t even considering making a move on it. “Dave’s going to tell people I tried to slip him the tongue,” I said. Also, this is the plan we made, but I don’t always stick to it. The vegetable part of the plan is always very loose. I just let the vegetables inspire me as to what I should make from them, for the most part, while also making sure to get from the farm what I know is in season and that I’ve made particular plans for. Like right now, it’s tomato season, so I can plan to make tomato sauce. That sauce we had Monday, however, was some I’d made before we went on vacation and I still had around that we needed to use, so we bought sausages from the meat counter and I simmered them in my leftover sauce. Mild Italian sausage (from co-op), homemade ragu (leftover, made from farm share tomatoes and 2# beef bones from freezer) with rice pasta, ricotta, parmesan. We have to keep the plan flexible, of course. In our meal plan this week, we forgot to schedule in Date Night, which is Saturday, and we’re making plans to go do things during the day, like the Big E or King Richard’s Faire, so instead of thawing cod and heating leftovers, we’ll go out somewhere, if we don’t get to the co-op first and buy sausages to roast. (Fresh sausage and eggplant is Date Night food, even if we have to make it from scratch, but leftover dry fish isn’t. Go figure.) I had the idea when yesterday I looked in the produce bins and realized we have a lot of eggplant and peppers. Making it this weekend will give us something to eat for lunch on Monday next week. Lunches are usually leftovers. Sometimes breakfasts, too. We usually eat leftovers for lunch, or I’ll have eggs and toast, or eggs with leftovers. I also make leftovers part of the meal plans for dinner. Sometimes I make extra entree, and other times I make extra of some side dish that we’ll eat several times throughout the week. This week, it was salt roasted white and sweet potatoes. I made them Monday, before the farm share arrived. When Kevin got home with it, I washed up the spinach and we ate it with pork chops. Tuesday, I processed a lot of greens: I blanched and froze kale for the winter, and washed salad for the week. On Wednesday this week, when leftovers came to a head, Kevin packed pork chops and cabbage and potatoes for his lunch, and I had eggs over spinach with butter fried slices of baked sweet potato for lunch. 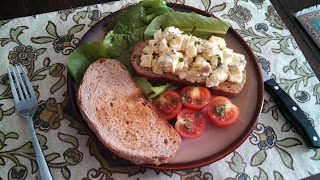 I boiled four more eggs and yesterday took them and half the leftover salt roasted potatoes, minced half an onion, and made egg and potato salad, which I ate on garlic toast with a green salad for lunch. When I got back from writer’s group, I ate a big pile of pan roasted vegetables on buttered bread, a page right out of Tamar Adler’s “An Everlasting Meal,” which I brought with me on vacation and took inspiration from this week in my cooking. I ordinarily do a bit of “striding ahead” and “catching my own tail,” as she eloquently puts it, but giving these activities poetic names makes me more apt to do them. Yesterday, which was Thursday, we had a couple of friends over for dinner, so I “monster cooked,” as someone described it. I made lots of food, of which we had some leftovers, but not so much mac and cheese that it’s going to do double duty. However, we have three eggplants and maybe half a dozen peppers, and a bag of Romas getting ripe, so I’m going to make an Italian meal again this weekend with some more sausages, roasted eggplants, peppers, onions, tomatoes, garlic, and whatever herbs and soft or hard Italian cheese I still have around by then. Eating it over polenta is half of what makes this a treat worthy of Date Night. We also keep running lists of items we want to buy the next time we go to Costco or Trader Joe’s, and will run down to the Liquors 44 and the Stop N’ Shop whenever we run out of wine or milk. What else do we eat, besides dinner? Kevin keeps a jar of trail mix at work that he keeps restocked with dried fruit and nuts from the bins. We both eat peanut butter as an occasional snack, breakfast, or lunch food, as well as to pill the dog. We split a pot of coffee each morning, and Kevin still drinks a fruit and yogurt smoothie each day, though I’ve fallen out of the habit. Now I’m more likely to have toast with a spread and some fresh fruit. We like to snack on potato chips, wine, and ice cream in the evenings. Every week’s different, and our diets change over time and with the seasons. I’ll do this again soon so you can get another idea of a typical week for the two of us. Let me know what kind of information you’d find helpful, too.